If you want to take anything other than a tour bus on the Denali Park Road, you’re going to have to first win the Denali Road Lottery. The park road is a 180-mile (round trip) challenge not to be taken lightly. In fact, at this time not even the Google Maps Streetview car has made the trip (feather in my cap). The tour bus takes a whopping 13 hours to make it to the end and back. Naturally, you won’t take that long on a motorcycle. The first 20 miles or so are paved, but then the road tansitions to a compacted gravel. At Savage River there will be a checkpoint with a park ranger – just show your road lottery tag that you picked up at the visitor center and you’re on your way. The vegetation is incredible in the fall. Reds and yellows were bursting through the patchy fog and made it look as though the tundra was burning everywhere around me. Unlucky me, my lottery day was a rainy one. I never got to see McKinley – or Denali – during the ride. But, the ride was a fun challenge with incredible views even if “The High One” was covered in clouds. I made up for missing the mountain on the next day, anyway. 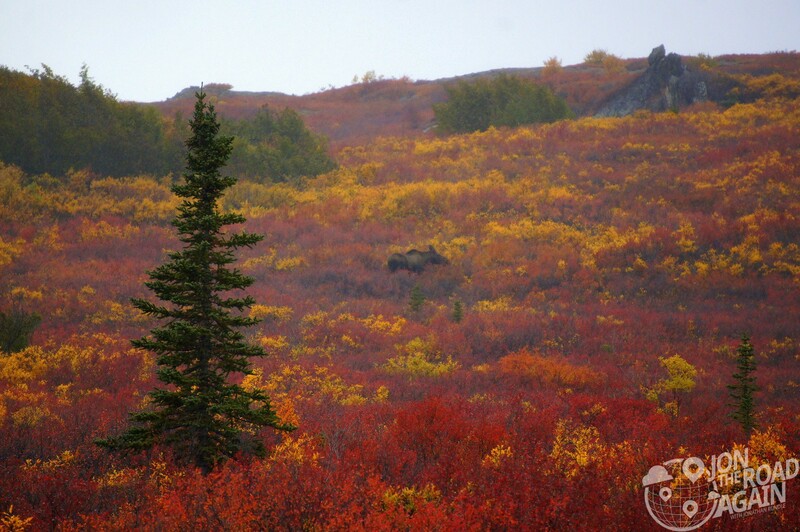 The photo below was taken at the Eielson Visitor Center (mile 66). The bike was covered in mud – and so was I. You will see wildlife. It’s easy to see, just look for all the cars stopped by the side of the road. Everyone will be hanging out watching the moose (or whatever you happen to see that day). If you’re like me, get an extra tight grip on those handle bars when you see the “Grizzly Bear Country” warnings along the road at Sable Pass (mile 39), Stony Hill (mile 61) and Thorofare Pass (mile 64). Polychrome Pass is a favorite spot because of the long vistas and the sweeping curves and steep dropoffs. Have your GoPro on here and peek over the edge a few times to scare your family when you get back home. Also, don’t worry about pulling off to take photos. The road is plenty wide enough to allow you to stop and take some photos wherever you want. As you can see below, Polychrome is probably the tightest spot on the entire road and there is enough room to stop and take some photos. Now, if every guy pulling a big RV did this, we’d have a problem. The road lottery is a popular event and many Alaskans have loaded up their RVs and 4×4’s for it. Prepare to get strange looks from vehicles as they pass by you, likely the only motorcyclist, on the route. 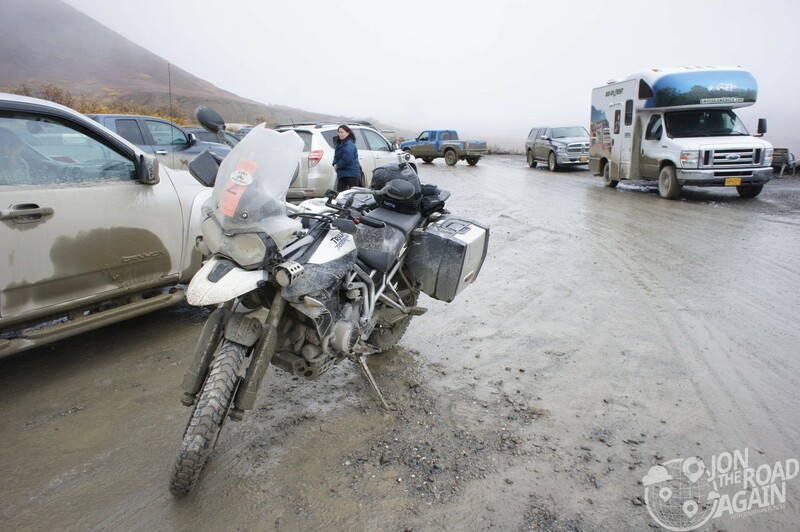 Enjoy the mud, gravel, dust and the amazing views during this impressive Alaskan experience. After a rainy muddy day, I was so happy to see pavement again. A little too happy.